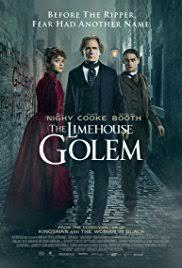 Review: The people in the city of London are living in fear as the serial killer, known as The Limehouse Golem, is on the loose and leaving written messages around. It is John Kildare’s job as a detective to investigate a series of murders in the hope of clearing a young woman’s name. I did enjoy this film although I found it quite slow in the middle. The second half went much quicker than the first. There was a lot more blood and gore involved etc which I was not expecting. Bill Nighy as always was very good but not his best film. Douglas Booth also did a fantastic job and you could say that everyone was exceptional in this. Bill Nighy’s role was originally given to Alan Rickman who had to pull out due to pancreatic cancer. I was not expecting it to end the way it did nor what the verdict would be. Others might already guess what is happening throughout the film and what the verdict would be but for me it came as a shock. I thought Juan Carlos Medina has done a fantastic job directing this as so many directors were in talks about directing this feature film. What a mess it could have been. Jane Goldman wrote the screenplay and has worked on films such as Kingsman: The Secret Service (2014) and also Stardust (2007).